Draft: 2006, Baltimore Orioles, CAth rd. Pedro Beato (pronounced bay-AH-toh)… Married Rosemary Sánchez (11/25/12); has one son, Adrian (11/13/14)… 2005 graduate of Xaverian High School (NY), where he played baseball… Attended St. Petersburg Junior College (FL)… Was ranked as the 13th-best prospect in the 2006 draft by Baseball America...Hobbies: Woodworking and cutting hair…Signed by: Nick Presto. Spent most of the season at Class AAA Pawtucket...went 1-1, 3.60 in 10 relief apps during 4 stints with the Red Sox (6/16-6/20, 6/25, 7/10-8/1, 8/7-8/8)...on 10/23 was designated for assignment...8 days later was claimed off waivers by the Reds. Combined to appear in 11 big league games between the Mets and Red Sox...Acquiredby BOS on 8/16 to complete 8/14 trade of C Kelly Shoppach.Went 1-0 with a 4.70 ERA (4 ER/7.2 IP) in 4 games with BOS over 2 stints, 8/26-27 and 9/21 through the end of the season...Tossed at least 2.0 innings in 3 of 4 outings with the Sox.Earned the win in relief in his Red Sox debut on 8/26 vs. KC, allowing 2 runs in 2.0 innings.All 7 outings for the Mets came in July, including 5 scoreless efforts...Matched a career high with 4 runs allowed on 7/23 vs. WSH (also 5/26/11 at CHC).Began season on NYM's 15-day DL with right shoulder stiffness...Transferred to the 60-day DL on 5/8 and activated on 6/6...Was optioned to Triple-A Buffalo 6/8 without appearing with the Mets.Made 24 appearances (1 GS) overall for Buffalo, including 6 on rehab, going 4-4 with a 4.14 ERA (17 ER/37.0 IP)...1st 3 rehab outings came with High-A St. Lucie 5/19-23, tossing 4.0 scoreless frames.Optioned to Pawtucket immediately after being acquired by the Sox on 8/16...Made 7 appearances for the club over 2 stints...Between the regular season and International League playoffs, combined to yield just 2 runs(1 ER) and strike out 9 batters in 8.0 innings.Designated for assignment on 12/19 to make room on the 40-man roster for Ryan Dempster...Outrighted to Triple-A Pawtucket on 12/21. Was selected in the 2010 Rule V Draft from Baltimore. ... Made his first Opening Day roster. ... Was placed on the 15-Day Disabled List on May 4, retroactive to May 2, with tendinitis in his right elbow. ... Was activated on May 17. ... Made his major league debut on Opening Day, April 1 at Florida, working 2.0 scoreless innings. ... Began his major league career by tossing a franchise record 18.2 innings without allowing an earned run, April 1-May 21 (did yield four unearned runs). ... That stretch was the longest among pitchers who started their major league career with the Mets. ... He allowed two earned runs on May 22 at New York (AL) to snap the streak ... Jack DiLauro held the old mark with 17.2 innings in 1969. ... Stranded 25 of 36 inherited runners. ... Ranked fourth among National League rookies in inherited runners scored percentage (31.0 percent). ... Was 19th among all NL relievers in stranding runners. ... Finished fifth among NL rookie pitchers with 60 appearances andwas sixth among NL rookies with 11 holds. ... Ranked second in the NL with 67.0 innings among rookie relievers. ... Was tied for second on the team with Bobby Parnell with 11 holds ... Jason Isringhausen led the staff with 19 holds. ... Earned his first major league win in a 6-3 victory on April 27 at Washington. ... Tossed 1.0 inning, allowing one unearned run. ... Worked a bullpen season-high 3.0 innings without allowing a run onMay 1 at Philadelphia in New York's 2-1, 14-inning triumph. ... Was 2-1 with a 3.38 ERA (15 earned runs/40.0 innings) prior to the All-Star break and posted a 5.67 ERA (17 earned runs/27.0 innings)after the break. ... From May 22 through the end of the year, he had a 5.96 ERA (32earned runs/48.1 innings). Spent the year with Bowie (AA) of the Eastern League, pitching as a full-time reliever...Led the Baysox in saves andfinished fifth in the Eastern League...Named to the Eastern League All-Star team...Recorded his first professional save on May 11 vs. Richmond...In his last 15 appearances of the season, pitched 16.1 innings and allowed two earned runs while striking out 14 andwalking four. Split the season between Frederick (A) of the Carolina League and Bowie (AA) of the Eastern League...Finished second on the Keys in innings pitched and tied for second in wins...Allowed three earned runs or less in nine consecutive starts to begin the season...Tied a career-high with eight strikeouts in a win, April 26 vs. Potomac. Played at two different levels...Pitched for Frederick (A) of the Carolina League after starting the season with the GCLOrioles (R) of the Gulf Coast League. Pitched the entire season at Delmarva (A) of the South Atlantic League...Allowed three earned runs or less in seven consecutive starts, May 25-June 26...Was a member of the World Team at the Futures Game in San Francisco on July 8. Made four relief appearances for Aberdeen (A) of the New York-Penn League before joining the rotation and going3-2 with a 2.79 ERA in 10 starts...Did not allow an earned run in 5.0 innings in his first start on July 17 vs. Jamestown...Did not surrender more than threeearned runs in any start. April 3, 2019 RHP Pedro Beato assigned to Diablos Rojos del Mexico. 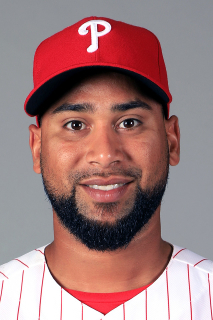 March 10, 2019 RHP Pedro Beato assigned to Philadelphia Phillies. November 2, 2018 RHP Pedro Beato elected free agency. October 13, 2018 RHP Pedro Beato assigned to Leones del Escogido. January 3, 2018 Philadelphia Phillies signed free agent RHP Pedro Beato to a minor league contract and invited him to spring training. January 3, 2018 RHP Pedro Beato assigned to Lehigh Valley IronPigs. November 26, 2017 RHP Pedro Beato assigned to Tigres del Licey. October 13, 2017 RHP Pedro Beato elected free agency. August 18, 2017 Philadelphia Phillies sent RHP Pedro Beato outright to Lehigh Valley IronPigs. August 17, 2017 Philadelphia Phillies designated RHP Pedro Beato for assignment. August 17, 2017 Philadelphia Phillies activated RHP Pedro Beato from the 10-day disabled list. August 12, 2017 Philadelphia Phillies sent RHP Pedro Beato on a rehab assignment to Clearwater Threshers. July 29, 2017 Philadelphia Phillies selected the contract of RHP Pedro Beato from Lehigh Valley IronPigs. June 26, 2017 Lehigh Valley IronPigs activated RHP Pedro Beato from the temporarily inactive list. June 23, 2017 Lehigh Valley IronPigs placed RHP Pedro Beato on the temporarily inactive list. January 6, 2017 RHP Pedro Beato assigned to Lehigh Valley IronPigs. December 21, 2016 Philadelphia Phillies signed free agent RHP Pedro Beato to a minor league contract and invited him to spring training. November 7, 2016 RHP Pedro Beato elected free agency. February 8, 2016 Baltimore Orioles invited non-roster RHP Pedro Beato to spring training. December 2, 2015 RHP Pedro Beato assigned to Norfolk Tides. November 26, 2015 Baltimore Orioles signed free agent RHP Pedro Beato to a minor league contract and invited him to spring training. November 6, 2015 RHP Pedro Beato elected free agency. October 15, 2015 RHP Pedro Beato assigned to Tigres del Licey. April 10, 2015 RHP Pedro Beato assigned to Norfolk Tides from Aberdeen IronBirds. April 9, 2015 RHP Pedro Beato assigned to Aberdeen IronBirds from Norfolk Tides. March 16, 2015 RHP Pedro Beato assigned to Baltimore Orioles. March 7, 2015 RHP Pedro Beato assigned to Norfolk Tides. March 4, 2015 Baltimore Orioles signed free agent RHP Pedro Beato to a minor league contract. October 1, 2014 RHP Pedro Beato elected free agency. July 11, 2014 Atlanta Braves sent RHP Pedro Beato outright to Gwinnett Braves. July 8, 2014 Atlanta Braves sent RHP Pedro Beato on a rehab assignment to Gwinnett Braves. June 17, 2014 Atlanta Braves recalled RHP Pedro Beato from Gwinnett Braves. April 9, 2014 Atlanta Braves optioned RHP Pedro Beato to Gwinnett Braves. April 4, 2014 Pedro Beato roster status changed by Atlanta Braves. April 2, 2014 Atlanta Braves claimed RHP Pedro Beato off waivers from Cincinnati Reds. March 30, 2014 Cincinnati Reds designated RHP Pedro Beato for assignment. October 31, 2013 Cincinnati Reds claimed RHP Pedro Beato off waivers from Boston Red Sox. October 23, 2013 Boston Red Sox designated Pedro Beato for assignment. August 10, 2013 Boston Red Sox optioned RHP Pedro Beato to Pawtucket Red Sox. August 7, 2013 Boston Red Sox recalled Pedro Beato from Pawtucket Red Sox. August 3, 2013 Boston Red Sox optioned Pedro Beato to Pawtucket Red Sox. July 10, 2013 Boston Red Sox recalled Pedro Beato from Pawtucket Red Sox. June 26, 2013 Boston Red Sox optioned Pedro Beato to Pawtucket Red Sox. June 25, 2013 Boston Red Sox recalled Pedro Beato from Pawtucket Red Sox. June 22, 2013 Boston Red Sox optioned Pedro Beato to Pawtucket Red Sox. June 16, 2013 Boston Red Sox selected the contract of Pedro Beato from Pawtucket Red Sox. December 21, 2012 Boston Red Sox sent Pedro Beato outright to Pawtucket Red Sox. December 19, 2012 Boston Red Sox designated Pedro Beato for assignment. September 21, 2012 Boston Red Sox recalled RHP Pedro Beato from Pawtucket Red Sox. August 27, 2012 Boston Red Sox optioned Pedro Beato to Pawtucket Red Sox. August 26, 2012 Boston Red Sox recalled Pedro Beato from Pawtucket Red Sox. August 16, 2012 New York Mets traded RHP Pedro Beato to Boston Red Sox. August 16, 2012 Boston Red Sox optioned Pedro Beato to Pawtucket Red Sox. July 24, 2012 New York Mets optioned RHP Pedro Beato to Buffalo Bisons. July 5, 2012 New York Mets recalled Pedro Beato from Buffalo Bisons. June 8, 2012 New York Mets optioned Pedro Beato to Buffalo Bisons. June 6, 2012 Pedro Beato roster status changed by New York Mets. May 25, 2012 sent RHP Pedro Beato on a rehab assignment to Buffalo Bisons. May 19, 2012 sent RHP Pedro Beato on a rehab assignment to St. Lucie Mets. May 8, 2012 New York Mets transferred RHP Pedro Beato from the 15-day disabled list to the 60-day disabled list. May 17, 2011 New York Mets activated RHP Pedro Beato from the 15-day disabled list. May 15, 2011 sent RHP Pedro Beato on a rehab assignment to Buffalo Bisons. May 4, 2011 New York Mets placed RHP Pedro Beato on the 15-day disabled list retroactive to May 2, 2011. Tendinitis in his right elbow. December 9, 2010 New York Mets claimed RHP Pedro Beato off waivers from Bowie Baysox. September 25, 2010 Pedro Beato roster status changed by Bowie Baysox. August 24, 2010 Bowie Baysox placed RHP Pedro Beato on the 7-day disabled list. April 1, 2010 RHP Pedro Beato assigned to Baltimore Orioles. October 16, 2009 RHP Pedro Beato assigned to Tigres del Licey. August 3, 2009 RHP Pedro Beato assigned to Bowie Baysox from Frederick Keys. June 20, 2006 Baltimore Orioles signed RHP Pedro Beato.